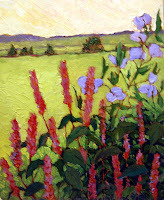 Recovering Self ~ May exhibit at Gallery IS. 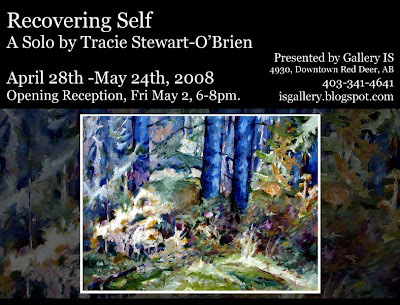 Gallery IS presents our next solo show by artist Tracie Stewart-O'Brien. Tracie is a local artist and this is what she has to say about her collection of works.
" “Recovering Self” depicts the artist’s personal struggle to discover, uncover, and recover her. After wandering both emotionally and physically as a result of painful events which caused her sense of self to become submerged, she entered into a time of rediscovery For her the non-linear process of discovery involves the application and removal layers of meaning as well as paint. As a result, a transformation occurs, which cannot necessarily be controlled either in art or in life, and understanding begins to emerge. 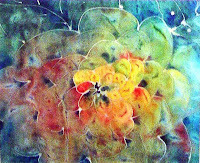 For Tracie the creation of art is one way to create cosmos out of chaos. She believes the process of creation is one way the “inner self” can be explored and what rises to the surface can help us to translate, appreciate and deal with difficult or cloudy issues in our lives. In creating these works the artist uncovers, recovers and discovers herself and shares her visual insights with you in the hope that you can relate and as a result we can engage in meaningful dialogue together." We hope you will join us on Friday May 2nd, for the artists reception. 6-8pm. This weekend April 18th, 19th and 20th we will be in attendance at the Lacombe Art Show and Sale in Lacombe Alberta. 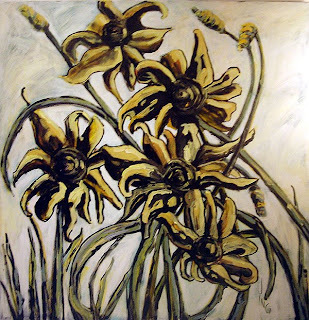 Artists in attendance will be Marie Banville, Viv Bennett, Beth Ferchuk, Erika Schulz and Jeri-Lynn Ing. Gallery IS will be closed on Friday but will be open on Saturday for your shopping and viewing pleasure. We are all looking forward to a wonderful weekend of art and we hope that you can join us. We are please to showcase some of your favorite artists- Vivian Bennett, Kate More, Rikki Renard, Erika Schulz, Jeri-Lynn Ing, Monika Dery and some new artists- Dan Milanese, Mellisa Russell, and others. "Portia" SOLD, "Ophelia", "Desdamona", and "Cymbaline" SOLD.